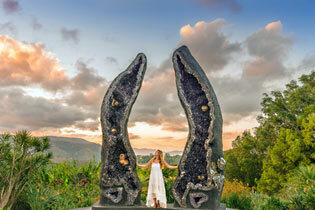 Byron Bay Visitor Centre on ph. (02) 6680 8558. 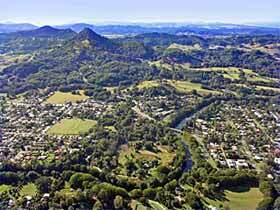 Mullumbimby or "Mullum" to locals, is just up the track from Byron Bay, and is the seat of the Byron Shire Council. This is a traditional Australian rural community that has long survived and prospered on dairying, beef, wool and small cropping. Macadamia Plantations, bush tucker agriculture, farm forestry and nature based tourism are thriving enterprises, while new capital investment is revitilizing the retail precinct, with eateries and new age retail outlets adding a touch of colour to the laid back atmosphere. Available accommodation includes cottages, guesthouses, hotels and motels in town, while an extensive choice of B&Bs and guesthouses can be found throughout the small settlements scattered along the country roads which wind between Mullum and Byron. The Chincogan Festival each September, sees the streets closed for parades and market stalls, with the highlight being the "Chincogan Charge", a round trip dash for the fit (and some would say foolhardy!) to the top of Mount Chincogan, a conical mountain which dramatically dominates the local scenery. Keen walkers can also find a noticeboard located behind the post office on the corner River Terrace and Burringbar St., suggesting six walks available through the town, ranging from 100 metres along Palm Park to the longest of 2 kilometres, which leads to Pioneer Lookout. World Heritage listed Nightcap National Park and Whian Whian State Conservation Area are within a half an hour drive. Convenient access to the walking tracks and picnic facilities at Whian Whian SCA, Rocky Creek Dam and to Nightcap National Park can also be enjoyed by visitors, with Minyon Falls, the circular walk and picnic area, making a popular day trip. But you don't have to visit these reserves to get a glimpse of the rainforest splendour of the region. Brunswick Valley Heritage Park, on the corner of Tyagarah St and Brunswick Terrace, is a reserve where over 200 rainforest species from various rainforest types have been established and labelled. This includes red cedars, durobby, flooded gum, grevilleas, water gum, hoop pines, swamp mahogany and rosewood. A walking path winds through the forest to park benches dotted around peaceful stands and displays of rainforest. Information on other walks and dog exercise areas in the Byron Shire can be found here. Getting to the region is easy: Mullumbimby is approximately 780 kilometres - about 10 hours drive north from Sydney and about 90 minutes drive south from Brisbane, via the Pacific Highway. Daily interstate coach services transit the town with transfers to Casino for rail travellers catching the daily or overnight train service to Brisbane or Sydney. See Countrylink services for timetables and more information. Visit Mullumbimby - Transport Services Information for more transport information, including trains, coach and local bus schedules, taxis, airport, and transfer services. Northern Rivers Carpool provides locals and visitors with the opportunity to share transport in the region.